Prior to our current millennium, whitebark pine seeds comprised a substantial part of diets eaten by grizzly bears in areas where whitebark pine was abundant–historically, second only to meat from large mammals in the Yellowstone ecosystem, and third only to berries and meat along the East Front in northwestern Montana. In such places, pine seeds were a disproportionately important source of dietary fat for female grizzlies. Greater consumption of pine seeds by females made sense given that their reproductive success was (and is) contingent on accumulation of body fat, which is predictably facilitated by consumption of a high-fat diet. And because growth or decline of bear populations is largely dictated by the survival and reproductive success of females, it is not surprising that access to pine seeds was historically correlated with growth rates of the Yellowstone grizzly bear population—more so than any other bear food. More than this, whitebark pine was the keystone of an entire system organized around its seeds and shade. Not only bears ate the seeds, so did squirrels, chipmunks, and a plethora of birds, most notably Clark’s nutcracker. In fact, whitebark pine and Clark’s nutcracker are considered by many scientists to be the classic joint fruits of a long coevolutionary history. Nutcrackers preferentially foraged on the robust fatty whitebark pine seeds, caching most of them for consumption later in the year. The pine, in turn, depended upon germination of seeds in some of these caches to produce new generations of trees. Once grown, the mature trees provided the additional service of shading deep snows beneath, prolonging the period of snowmelt, attenuating summer-long stream flows, and thereby providing all sorts of benefits to aquatic biota. But whitebark pine is nearly gone from our northern landscapes, in most places reduced to lingering ghosts in the form of gaunt skeletal snags or scattered seedlings doomed to die. Several factors have contributed to this demise, but all can be traced back to people, whether the choice of a few to introduce white pines from Europe contaminated with a fungal disease that would eventually wreak havoc with all our five-needled pines, of which whitebark pine is one, to choices by multitudes to live carbon-intensive lives manifesting in an over-heated greenhouse world. In fact, whitebark pine is a poster child for the unintended consequences of human driven global change. The details of all this matter, especially given the cloud of obfuscations that surround much of the current debate about climate change and related prospects for whitebark pine. Which brings me to the sinister or more deceptively pedestrian protagonists in this story of an unravelling natural system. All life on Earth is confronted by a stark and increasingly unavoidable reality. The world is becoming a much hotter place at a rate that will challenge the adaptive capacity of all species, many of which will disappear into the oblivion of extinction. Emblematic of this unfolding catastrophe, the figure above shows projected temperatures (top) and precipitation (bottom) for the Yellowstone ecosystem, once a stronghold for whitebark pine. Tony Chang and Andy Hansen produced these projections employing three different scenarios that make different assumptions about future social, economic, and physical changes of relevance to climate change (ea_rcp85 is the most pessimistic, ea_rcp45, the most optimistic). Even the most optimistic shows major warming. The most pessimistic projects monumental change. Regardless of the scenario, comparatively large increases in temperature will offset the more modest projected increases in precipitation to yield ever more widespread, long-lasting, and severe drought. ​The upshot for whitebark pine, a denizen of cold environments, is bleak, in fact catastrophic. The effects will be direct as well as indirect. The direct effects will be through surpassing physiological tolerances. The indirect effects will be legion, including the promulgation of lethal insects, devastating fires, and the up-elevation dispersal of more drought- and warmth-tolerant competitors. There is a veritable cottage industry of scientific activity devoted to turning out projected changes in species’ distributions under different climate change scenarios. Perhaps because whitebark pine is such an interesting case, it has been the subject of multiple independent modeling efforts, more than have been devoted to any other species I know of. According to my latest count, there are at least 10 different publications reporting projected changes in the distribution of whitebark pine, including efforts focused exclusively on this species, as well as efforts that have addressed whitebark pine as part of an ensemble. The first projection was reported in a 1991 publication by Bill Romme and Monica Turner. In it, they forecast an approximate 90% loss of whitebark pine in the Yellowstone ecosystem during the next 100 years, well pre-dating the major losses that, in fact, happened 10-20 years after publication of their paper. Despite ever more sophisticated methods, all the subsequent modeling exercises have produced essentially the same result. A map modified from one of the more recent endeavors, by Tony and Andy, is immediately above. Different colors denote the probability that whitebark pine will be present at three future time steps. Warmer colors represent a higher probability, cooler colors, a lower one, and no color at all, a near-zero probability. You can see the shadow of Yellowstone National Park’s boundary in the middle. The upshot is that by 2099 the only places in the Yellowstone ecosystem where whitebark pine will have even a modest chance of surviving is on the Beartooth Plateau, in the Teton and Wind River Ranges, and a few enclaves in the Absaroka Mountains. Notably, all these projections have been based largely, if not solely, on a reckoning of suitable climate, i.e., the “climate envelope.” Proximal prospective causes of decline are usually not addressed, which matters, because tree species are rarely killed outright by climate. Instead, individual trees are rendered more vulnerable to any number of proximal lethal agents. In the case of whitebark pine, these include the non-native fungal disease white pine blister rust, native Rocky Mountain pine beetles, wildfire, and competition at stand initiation from lower-elevation species, notably lodgepole pine and Douglas-fir. Mountain pine beetles have emerged as probably one of the most severe threats to whitebark pine. Bark beetles lay eggs under the bark of mature or near-mature trees, after which the resulting larvae kill the host tree by girdling it; i.e., by eating through the entire circumference of the life-giving cambium that trees depend upon for transport of water and minerals from the roots, and carbohydrates from the leaves. However, bark beetle larvae can’t survive to inflict damage if temperatures either drop rapidly to low levels during the fall (say, -30 degrees F in November) or are cold enough, for long enough, during winter for temperatures beneath the bark to drop below -40 degrees F. In other words, cold temperatures are critical to shielding whitebark pine from outbreaks of mountain pine beetles, to which they have little natural resistance. This thermal shield is especially important in areas where extensive lower-elevation lodgepole pine forests serve as a near-inexhaustible reservoir of beetles. ​Mountain pine beetles have already had devastating effects on whitebark pine in the Yellowstone ecosystem. A survey conducted during 2009 by Wally Macfarlane and collaborators showed that nearly half of all whitebark pine forests exhibited severe mortality from an outbreak of bark beetles that began around 2000. Recent research published by Polly Buotte and three co-authors clarified what was going on with climate during and before the outbreak. There had not been as favorable a climate for beetles in the whitebark pine zone since at least 1950. She was also able to develop a simulation model that allowed her to project what would likely happen with beetle outbreaks at high elevations as the climate continues to warm. Her results are summarized immediately below. 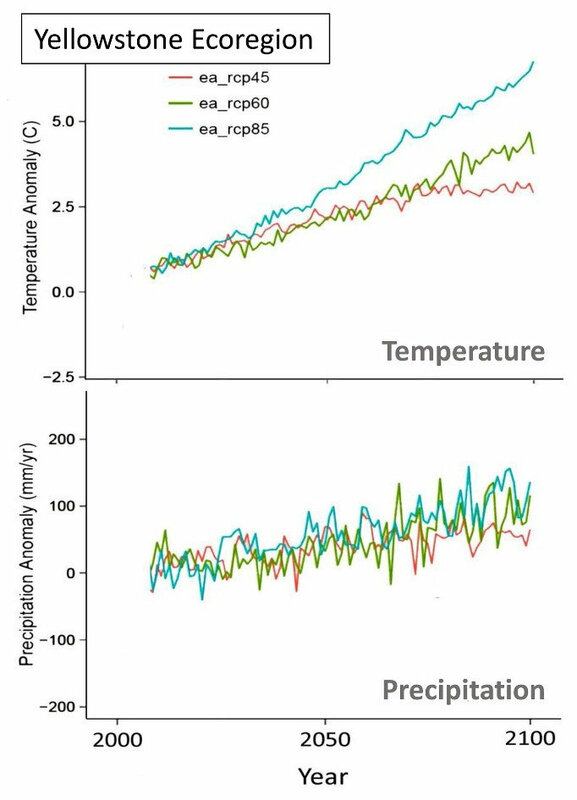 The figure at left, above, shows the results of Polly’s simulation model (the black line and associated variability of results in orange and gray), both back-cast and forecast, along with observed historical climate suitability for beetles (the red line). The historical average is shown as a vertical dark-gray line projected out to 2100. The inset figure above shows the observed extent of beetle-kill among whitebark pine (red dots), as well as modeled predictions (black line and gray bounds). These results show, first, that climate suitability was high during the outbreak, unlike any time during the previous 40 years; and, second, that suitability of climate for beetles is likely to steadily increase to sustained levels much like those that typified the 2000-2009 outbreak. Importantly, the kind of warmth observed during 2000-2009 allowed, not only for beetle larvae to survive over-winter, but also for beetles to complete more than one generation in a single summer season. The results will be chronically fatal to any whitebark pine tree big enough to be beetle-fodder. ​The map above right translates the modeling results into spatial form, reckoned as the probability that beetle-caused mortality of whitebark pine would occur in given areas during an approximate 30-year period. Red denotes a probability nearing certainty. Even as early as 2040, a mere 20 plus years hence, there will likely be no refuge from bark beetles for whitebark pine in the Yellowstone ecosystem. Regardless of the nature and degree of heroic restoration efforts, any whitebark pine that survive to be pole-size trees will likely fall prey to beetles. Even though wildfire often benefited whitebark pine historically, this will probably no longer be the case. Under “normal” conditions, wildfires disproportionately kill shade-tolerant competitors such as subalpine fir and Engelmann spruce, and create an environment favorable for the establishment of shade intolerant whitebark pine germinating from seeds cached by Clark’s nutcrackers. Without fire, whitebark pine would be slowly replaced over the centuries by spruce and fir. But, despite this, mature whitebark pine are not particularly fire tolerant. They are killed by fire at near the same rate as spruce and subalpine fir. ​The upshot is that if wildfire becomes more frequent, concurrent with increasing invasion by lower-elevation shade intolerant and fire-adapted species, fire may hasten the demise of whitebark pine. The regenerative advantage of whitebark pine that otherwise comes with fire would be lost, while mature trees capable of surviving for centuries would be brought to an early demise. Virtually every prognosis of wildfire extent and frequency in the western United States during the next several-hundred years shows that both will increase. Another consistent result has been that fire severity will lessen in most places as increasingly frequent burns preclude the accumulation of large fuels that would otherwise sustain hotter wildfires. Recent research has suggested that high-elevation habitats such as those typical of whitebark pine will not be exempt from these patterns, as climate increasingly favors lodgepole pine and Douglas-fir in places previously occupied by whitebark pine. All of this holds true for projections specific to the Yellowstone ecosystem. Perhaps the most apocalyptic research results were reported in 2011 by Tony Westerling and his co-authors, who projected that forests would essentially disappear from most of Yellowstone to be replaced by grass- and shrublands, primarily because fires would be so frequent that they would preclude successful regeneration and recruitment of trees. More recent research by Jason Clark, using a more sophisticated simulation model, shows the same trend, but with some twists. His results are summarized in the figure immediately below. 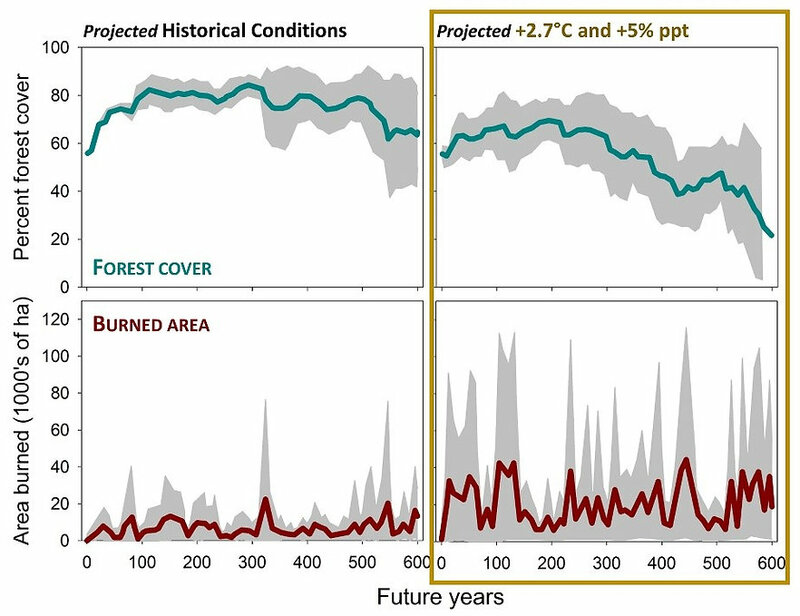 The top graphs show simulated trends in extent of forest cover paired with graphs beneath showing trends in the extent of burned area, comparing simulations that project historical conditions, at left, with projections assuming a climate approximately 5 degrees F warmer and 5% wetter, at right. Forest cover will likely decline substantially, coincident with larger and more frequent fires. So, Clark’s results were much the same as Westerling’s. But the twist is that Clark forecast that Douglas-fir would increase and that lodgepole pine would decline, primarily because Douglas-fir is better adapted to cooler frequent fires, which debars a need to reproduce and recruit at an otherwise hectic rate. But, of relevance here, whitebark pine is more like lodgepole pine than it is like Douglas-fir. In fact, whitebark pine is even more vulnerable than lodgepole pine to the scenario painted by Jason Clark given that it takes much longer for whitebark pine to mature and produce cones. ​The implication? Future wildfires will likely hasten the demise of whitebark pine rather than foster its persistence in an increasingly hostile world. Some people claim that all will be well with whitebark pine simply because it survived, diminished, but still comparatively abundant during the Altithermal—an exceptionally warm-dry period spanning 9,000 to 5,000 years before the present, and the warmest driest period of the last 70,000 years predating the current extremes that began around 1970. But there are several problems with this claim. First, paleoecological reconstructions of whitebark pine abundance are based almost wholly on its pollen, which is indistinguishable from that of limber pine. The potential conflation of whitebark pine pollen with pollen of the warmth-adapted limber pine is a problem because limber pine probably increased in abundance during the Altithermal, and thereby accounted for an increased but unaccounted-for fraction of generic white pine pollen. But more problematic, paleoecological apologists assume that, aside from climate change, the world was pretty much the same then as now, especially when it comes to things that threaten whitebark pine. But it wasn’t. Paradoxically, lodgepole pine and Douglas-fir were less abundant, which means that they were probably not as much the competitors then as now. With less lodgepole pine, the reservoir of bark beetles was also probably less. For whatever reason, fires did not increase in prevalence during the Altithermal as much as one might expect. In short, much of the context for whitebark pine was probably more favorable then compared to now and the likely future. Certainly, blister rust was not around. And, then, there is burgeoning rhetoric about prospects for heroic well-funded restoration efforts. Research into prospects for and methods of restoring whitebark pine have proliferated since the early 1990s. The genesis of this effort was early losses of whitebark pine to white pine blister rust and resulting concerns about the species’ acute vulnerability to this non-native fungal pathogen. This legacy has continued to powerfully shape perspectives of researchers and managers and keep blister rust at the center of attention. But, as I’ve described here, blister rust is just one of several severe threats to the persistence of whitebark pine. All but blister rust are fueled by climate change, including physiological constraints and tolerances; increasing competition at stand initiation from drought- and warmth tolerant species; increasingly frequent and extensive wildfires; and increasingly common and unmitigated outbreaks of mountain pine beetles. Given this plethora of severe threats, I am frequently struck by the extent to which otherwise intelligent scientists are afflicted by glaring blind spots in their framing of research and deliberations over restoration. They will consider blister rust, but ignore changes in fire behavior and the threat posed by lower-elevation competitors. They will consider fire, but then continue to ignore competitors and, more surprising yet, mountain pine beetles. They will consider pine beetles, but ignore fire. And so on. ​The upshot is a widespread tendency to overstate prospects for whitebark pine and restoration efforts organized around over-coming blister rust. To be sure, blister-rust-resistant strains of whitebark pine have been found and propagated, increasing the odds of survival among such stock by 2- to 5-fold. But virtually every other consideration is more-or-less swept under the rug. Never mind that odds of planting blister rust resistant strains in typically roadless rugged terrain sufficient to sustain ecological function is close to nil in the first place. What then about the fact that currently hospitable sites will become increasingly less so, climatically and because of invasion by lodgepole pine and Douglas-fir? What then about bark beetles, which will predictably kill any trees that reach or approach maturity, probably before or soon after they can produce cones? What about the increasingly frequent wildfires that will likely burn the places you’ve planted with blister-resistant stock, again, before or soon after the trees produce cones? I find the impulse towards optimism to be understandable. But, optimism founded on seemingly willful blindness to inconvenient truths is a poor basis for any projection and related planning for likely future scenarios. I love whitebark pine. I have a deep emotional connection to the tree itself and the places it grows. But that does not make me any more tolerant of platitudes or palliatives. Barring a few enclaves, whitebark pine will almost certainly be lost in the northern US Rocky Mountains and, with that, it will be, to all intents and purposes, forever lost as a grizzly bear food and ecosystem keystone in this part of the world. Wishful thinking will not make it otherwise.